Formerly known as TNSWorld panel, Kantar WorldPanel is an internationally recognized company that through its continuous survey provide consumers insights on recognized brands. Many Industry experts use TNS as a reference guide for getting detailed analysis on their products and measuring actual consumer behavior in any market. The company operates in 11 counties. This includes the United States of America, United Kingdom, Germany, China, Spain, Australia, Argentina and Mexico. Its fresh report on mobile device sales across many key markets suggest that Windows Phone has gained some momentum and has gone ahead of RIM to certain extent. This makes it officially the third biggest OS in USA and in the key 8 countries, including USA, UK, Germany, France, Italy, Spain, Australia and Brazil. 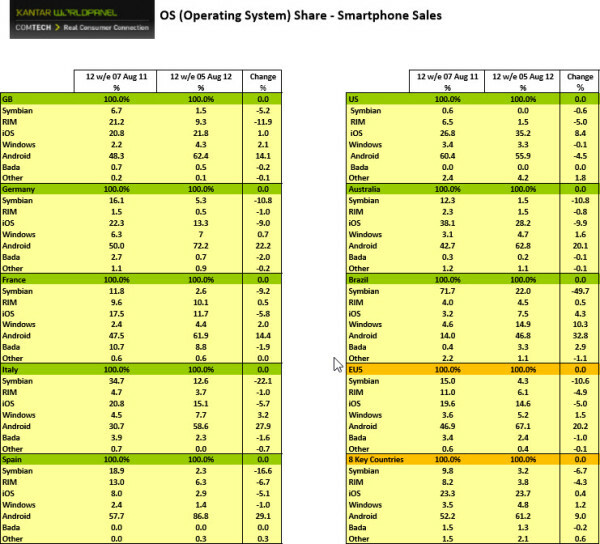 Windows Phone has managed to hold 4.8% market share, up from 3.5% a year ago and ahead of Symbian at 3.2% and RIM at 3.8%. Google’s Android OS still dominates with a total mobile market share of 20.2 % followed by iOS. Though the rise is marginal and still in single digits (5%) for Windows Phone, it has started showing some positive signs in that its percentage of sales is growing in different markets and will continue to grow if they perform the same way. It is interesting to look at the impact a larger screen size has on how consumers use their smartphones, particularly as the line between tablets and smartphones becomes more blurred. Consumers who own a smartphone with a larger screen tend to be much more engaged with their device across a whole array of functions. For example, only 19% of consumers with a screen smaller than three inches download/watch videos, compared to 65% when the screen is five inches or more. What may come as a surprise to us is that the report by Kantar suggests Windows Phone has 14.9% market share, ahead of iOS in Brazil.